The City of Fall River is nestled in Southeastern Massachusetts, close to the Rhode Island state line. An old mill city, its façade is one of industry: the old mills are almost everywhere you turn, some of them now even refurbished for things like doctors’ offices and gyms, their worn faces poking over the tops of double- and triple-decker houses. 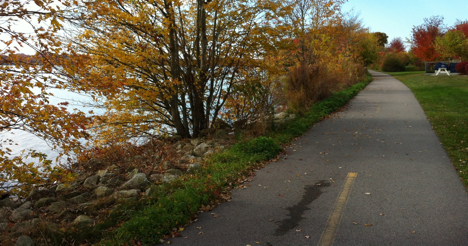 But if you drive south into Fall River, almost to Rhode Island, a hidden gem of serenity lies: a bike path along the South Watuppa Pond. The path is less than a mile long, and the pavement is close to 10 feet across, with dotted yellow marks delineating two lanes. On one side of the path are reminders of the “real-world:” local restaurants like LePage’s Seafood, the office of electronic healthcare records company Meditech and the sounds of people in cars along Interstate-195 whizzing to their next appointments. But the other side is a welcome contrast, especially for residents like myself: a sweeping view of the South Watuppa Pond, a small swampy marsh, a picnic table and foliage. Get far enough down the path and you have to strain to hear the noise of the cars. It’s clean, too; the grass is unmarred by trash, and in my visits, even the swampy interlude near the end of the path was home to only one empty, abandoned bottle. What’s even more remarkable about the peaceful bike path along the South Watuppa is that a little more than six years ago it was an abandoned railway spur — a symbol of urban decay transformed into a harbinger of renewal. Soon there will be more paths — this one will join with a proposed rail trail along the Quequechan River. And if advocates get their way, Fall River’s small network of tracks-turned-trails will someday be part of a network that extends along much of the East Coast of the United States, all the way from Maine to the Florida Keys. The rails-to-trails movement is booming in the United States. While most of the attention recently has focused on high-profile projects, like New York City’s The High Line, similar transformations have actually been sprouting up across America for years, in places like Fall River. The trails have become popular not only because they encourage people to get outside, exercise and enjoy nature, but because they also connect neighboring communities. In 1986 there were somewhere near fewer than 200 miles of rail trails; today there are almost 20,000 miles, said Carl Knoch of the Rails-to-Trails Conservancy, a Washington D.C.-based nonprofit group. “Our mission is to build a nationwide network of trails and connecting corridors to create healthier places for healthier people,” said Knoch, who has been involved with rail trail work since 1998. Rail trails are made possible largely because many rail corridors were sold and abandoned after the rail industry underwent a big consolidation, especially after the development of the interstate highway system almost 30 years ago, said Knoch. Although Knoch does not know for sure how many miles of abandoned railway there are, he said Rails to Trails does track developing projects. And while they might not know about every project out there, their database shows there are currently “675 rail-trail projects for a total of 7,811 miles,” said Knoch. On the surface, creating a rail trail is simple: plan it and build it. But it’s actually a lot more complicated; it’s often not easy to determine who owns the abandoned corridor, much less come up with enough money to cover planning, design, construction and maintenance, said Knoch. He said the money often comes from a mix of sources: foundations, state bond issues, advocacy groups like the Rails to Trails Conservancy who run capitol campaigns, state agencies and, of course, volunteer labor and donations. If you ask people who use the South Watuppa Bike Path how they feel about it, the response is unanimous: they love it. “We come here to walk because it’s nice and sheltered,” said Beth, a resident of Tiverton, R.I. who walks the path with her dog. Although she said the development of the path did not increase her walking activity, Beth still drives from Tiverton with her dog to walk in Fall River, and her only criticism was that none of the original railroad tracks were kept on the pathway. For people like Elizabeth, another resident who walks the path with her dog and a friend, the path’s construction has “for sure” increased her walking activity. “They walk the path with their dogs, and also bikers, and people that just want to jog or walk,” she said, also mentioning that she thinks the trail is a good place for people to come visit because it’s safe. The vision behind Fall River’s rail trail came to fruition during a 2004 charette, a meeting hosted by the Massachusetts Executive Office of Energy and Environmental Affairs (EOEEA) as part of the Urban River Restoration Project, said Julianne Kelly, coordinator for Mass in Motion – Fall River for the Governor’s Mass in Motion Municipal Leadership Grant program. A charette is a meeting at which designers, urban planners and community members discuss their ideas for a specific project; in Fall River’s case, it was a rail to trail conversion. In the fall of 2008, with a construction budget of $462,000, phase one, the bike path along the South Watuppa Pond, was completed. Phase two of the project, an extension of the finished path stretching into downtown Fall River, is fully permitted, almost fully planned, and will most likely go out to bid this March, said Kurt Gaertner, director of sustainable development at the EOEEA, an organization which was not involved with the South Watuppa path in phase one. And, phase two of the trail is fully funded: by late 2013, Governor Deval Patrick already announced millions in funding for the project, and this January he announced approval for even more support. “Governor Patrick made additional funding available through his Signature Urban Parks Initiative to complement the trail work already planned,” said Gaertner, who also stated that the total funding for the project is now at $9.1 million, with $7.7 million coming from EOEEA and $1.4 million from the Massachusetts Department of Transportation. Although $2.5 million of the $7.7 million from the EOEEA is going to restore one of Fall River’s other green spaces, Father Travassos Park (which could eventually be connected by a separate, parallel trail to another park at the end of the proposed Quequechan Trail), $5.2 million has been allotted for the Quequechan Trail project, said Gaertner, with all work expected to be completed by the end of fiscal year 2015. This trail has been nearly 10 years in the making: in the early 2000s, the concept for the trail in Fall River was developed through The Urban River Restoration Project with great input from the community, which subsequently lead to a conceptual plan and then progressed from there, said Stephanie Cooper, assistant secretary for land and forest conservation at the EOEEA, of the Fall River project. “…There are a lot of projects like this that have a conceptual plan, but the really big deal is putting the dollars behind it, to be able to implement it,” added Cooper. While plans for the project, after phase one’s completion in 2008, were shelved for a number of reasons, said Kelly, in the spring of 2010, Fall River Mayor Will Flanagan appointed Kelly of Mass In Motion to chair the Open Space and Recreation Plan Task Force. Through the plan, the idea for the Quequechan River Greenway was resurrected, added Kelly, who also noted that the goal immediately got traction with the Gateway City Parks Program. But not everyone is a fan of rail trails. While Kelly of Mass in Motion said the response from the Fall River community in regards to the trail plan has been “great excitement” and that there hasn’t been any major pushback, both Knoch and Banks independently described the “not in my backyard” phenomenon, in which community members worry that the trails’ proximity to their homes will bring crime and trespassers on or near their property. “Sometimes we also run into ‘not in my backyard’… issues where people do not want a trail in their neighborhood or near their home, but these critics often become trail users once the trail opens,” said Banks of her experience with North Carolina trails. And Knoch, of the Rails to Trails Conservancy, argues that research shows that having more eyes on the trails actually decreases crime and illicit use of the previously abandoned land. The trails also decrease pollution by giving people a pleasant way to travel without a car. And “… trails and greenways can function as non-motorized transportation corridors to help pedestrians and cyclists access schools, workplaces and neighborhoods,” said Stuart Macdonald, editor of American Trails Magazine, the publication of American Trails, a non-profit organization that works to protect interconnected trails. And the trail in Fall River will have another specific purpose: “A most immediate goal would be to take residents from some of these urban neighborhoods in downtown Fall River to a very large protected piece of land called the Fall River Bioreserve,” said Gaertner, of the Quequechan River Rail Trail. The Southeastern Massachusetts Bioreserve is currently hard to get to by foot or bike, but the trail will allow downtown residents easier access, he added. But beyond that, said Gaertner, the Quequechan River Rail Trail will eventually connect Fall River with something more substantial, such as the “Providence to Provincetown” bike path. While the route of the “Providence to Provincetown” bike path is not finalized, it is currently measured to be approximately 130 miles, said Jacqueline Schmidt, senior transportation planner for the Massachusetts’s Southeastern Regional Planning and Economic Development District. And, the Quequechan River Rail Trail could eventually be a spur off the main Massachusetts pathway of the Maine-to-Florida East Coast Greenway, said Gaertner. One of the reasons the trails are growing is that parks and outdoor spaces are economic engines, said Cooper: in 2013 The Trust for Public Land reported “outdoor recreation” annually generates $10 billion in consumer spending, $739 million in state and local tax revenue and provided 90,000 state jobs in Massachusetts. That’s especially important in small cities like Fall River that are trying to build a post-industrial future.